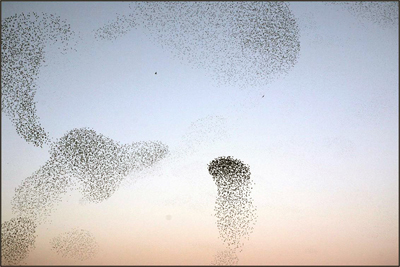 Flocks of European starlings exhibiting collective behavior. Photo credit: Andrea Cavagna. 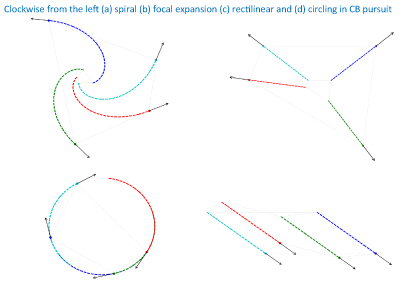 "Symmetry and reduction in collectives: cyclic pursuit strategies" was written by two University of Maryland alumni, Commander Kevin Galloway (EE Ph.D. 2011), an assistant professor in electrical and computer engineering at the U.S. Naval Academy; and Eric Justh (EE Ph.D. 1998), an electronics engineer at the Naval Research Laboratory; and Professor P. S. Krishnaprasad (ECE/ISR).